Since so many things happen, I forgot about updating this website again. So what kept me busy? Mostly work and travel, my friends, and my family. It seems like time just passes by in a blink when I am entertained. I started off the new year with an early night in Tangalle, Sri Lanka. The first time since childhood that I was in bed on New Year’s Eve before midnight. The trip to Sri Lanka was eventful and I managed to spend time with Lars and Lisa. The best tool at the moment to keep track of what I did this year is my Instagram account. Without documenting things visually, I seem to forget easily. Might be due to my increasing age. Luckily, this year I had the chance to see a lot of art and spend a significant amount of my free time in contemporary art exhibitions and in nature. In January, I saw Grimes at the Laneway music festival and this woman might be one of my favorite live performers with so much energy and strength. In February, Hedi came to visit me and we had a lovely time exploring the city. Because it was Lunar New Year most of the sights were closed so we could go out and enjoy the beach and temples in Singapore. Later that month I met up with my parents in Hong Kong and had a chance to catch up with Christoph, my room mate from the previous year. In March I spend some days in Dubai, Sharjah and Abu Dhabi to enjoy Art Dubai, the global art forum, the Dubai literature festival, and some related art events. I truly enjoy my time listing to interesting people and getting updated on current trends. In the same month, I also had the opportunity to reconnect with Mona from Oslo and Shoushou from Cairo during a short stay in Bali. In May I went to Hong Kong again and enjoyed the food and hospitality of the people who live there. In the same month, I took great joy in traveling back to Germany to see my family. Till hosted a lovely barbecue in his garden and I could get an impression of how fast Bo is growing. Lotte organized for me to give a lecture at my alma mata which was a nice change but underwhelminly visited. My friend Till surprised me with going to a trampoline park which was a day full of joy and happiness. I caught up with all of my three parents and my grandmother, as well as some of my dearest friends before I took the next plane to go to Oslo for work and my birthday. Having the greatest bunch of Norwegians and expats as friends in Oslo, my birthday picnic made my whole week. Surprisingly it was summer in Oslo during my stay which is the most amazing time of the year. Dragana and Alex were the best hosts imaginable and I am excited to meet their new family addition next time I am in town. Of course it is not only play but also work, so I participated in a conference my former PhD advisor organised and met one of my previous PhD examiners. My last day in Oslo was spend wisely with Lars at the harbor fest and we were allowed to sit on big trucks and visit huge ships. July, I spent in the US. First with Karim, Dustin, Mauricio, and Marissa in Los Angeles and then at Chris and George’s wedding in Asheville. The wedding was super relaxed and great fun. October was the month that I went to Gerolstein to see my parents and enjoy the greenery of the area. Later that month I went to the US again, to see Walter, Marissa, and Christina in New York, Karim, Dustin, George and Chris in Washington D.C. I managed to catch up with my first boss in Singapore who moved back home some years ago. Later, I met up with my former PhD examiner in Annapolis and talked to the students at the Naval Academy. The next day I participated at a conference in Baltimore. In November Peggy came to visit me in Singapore for the second time already and we made use of the proximity and spent a week in Cambodia to see the impressive tempels in Angkor Wat and get a look at Phnom Pennh. Peggy is one of the very small selection of people that I can spend a stretch of two weeks with without getting tired. It was two weeks of high-fives and I noticed that I have not been laughing as much recently. Peggy made me catch up on my laughing deficiency in no time. The rest of the year I will spend catching up on work, visiting my cousin Sony in Melakka and traveling to Ho Chi Minh City with Nadia and Nabha for Christmas. Work-wise, I initiated the first Middle East Film Festival in town and surprisingly it was a success. Otherwise I did not manage to publish another edited volume this year. But it will be there next year. Politically, this year was full of surprises and I am interested to see what the future brings. This year six of my closer friends in Singapore moved away and that makes me sad but luckily the planet is small enough and technology goes far when wanting to stay in touch. Before they left, I tried to spend as much time as possible with Walter, Karim, Dustin, George, Chris and Andrew. Through the years, I learned that if you like to stay in touch, there is always a possibility. Nothing enriches my life more than connect to the people I love. The flat mate of the year award goes to Andrew. Best Patrick of the year goes to Patrick. Best baker of the year goes to Charlotte. Best bar-hopping buddy goes to Nabha. Best bears goes to Karim and Dustin. Best life-advice-giver goes to Chris. What did I learn this year? Trying to relax and spending enough time in different forests, I learned that I have to think about investing my money, and I continue to work on being more calm and letting go of my ego. Once again a busy year and I have the feeling I might not want it any other way despite being a bit exhausted at times. I was traveling a lot for fun and for work. Starting the year off very nicely in January with a visit from Heather. Together with Katharina we went to Melakka and ate ourselves through the city. At the end of the same month I went to Seoul with Vinay. We looked at Temples and art, drank Sujou and met up with my friend Gi Yeon. Surprisingly I had some work to do in town and gave a lecture at one of the universities before running to the airport to catch a flight to Harbin (north China). In Harbin we visited the biggest ice festival in the world, had whisky in a brothel and drove a tank on a frozen river. Besides the magic of seeing huge illuminated palaces made from ice and walk around in a winter wonderland, we also repeatedly took giant donut rings to slide down a mountain of ice. In February my parents came to visit and we spent time in Ubud looking at temples and enjoying the rainy season in Bali. Bali is really not my favorite place but I do enjoy spending time with my family. In March I went to Dubai, Sharjah and Abu Dhabi to meet old friends and be at the global art forum, Art Dubai and Sharjah Biennale. It was really nice being back in the Gulf and having dinner with Jenny and lunch with Russell. I also enjoyed a lot of panels at the art forum, especially because it was connected to media this year. Can’t wait for next year. I went with Charlotte who works with me and we managed to eat all the good Lebanese and Persian delicacies that we miss here. In April I finally went to see cousin Sony in Melakka, after not having met up in a while. It was great catching up and also learn more about the family history. In May I went to Seoul again because I felt I did not see enough when I was there in January. That is why I organized a workshop there in cooperation with another research institute. Spend time with Gi Yeon again, hiked up a mountain with Veronika and got excited about visiting tons of art galleries. I would immediately move there if I could. Such a beautiful place. Then it was my birthday which I celebrated with a picnic in West Coast Park with all the friends that were in town. There was a lot of cake, sparkling beverages, a view of the harbour and big shipping cranes, frisbee, dogs, and happy people. Also Christoph (one of the three roommates of the year) made a lot of fabulous cake and Andrew brought cherry wine (uh-hu!). In June I had a brief stopover in Doha to say hello to a new friend. In June I also attended a conference in London and met up with Mona and Koen who I haven’t see in a while. The conference was great because I finally had some input I could relate to since it was about globalization and media studies instead of policy things. And Koen and Mona were great too because we had tons of material to laugh about. From London I went to Berlin to catch up with everybody and also celebrate my grand mother’s birthday. Lars and Cecilie came from Norway to say hello, so did Anne from the Netherlands. Lucky enough I could catch up with my family as well as old friends like Florian, Till, Fabi, Lotte, Roland, Raluca, Arne, Sarah and so many more. Together with Stefan and Steffie I went to Venice Biennale which was probably one of the highlights of my year. So much art with my favorite artsy company. Then Patrick came from Singapore and I could show him Berlin. After a week of eating cake and looking at beautiful things our ways parted. This time it was even harder to go back home to Singapore because I really soaked in the time with every one I love. The great thing about this world is that it is getting smaller and smaller but the sad thing is that the star track transporter is still not invented and I can’t just drop by someone’s house thousands of kilometers away. I really miss my close friends a lot, a lot of the time. That is why I went to Bangkok in July to catch up with Dragana, Mariko, Oystein, Casey and Khach. It feels so good being around close friends and having a good time going out and lounging around. After having some really awesome days in the city our ways parted, I took Dragana with me to Singapore and tried to show her as much as I could of my new home. With a heavy heart I let her go home to Oslo. Surprise! In August, I did not leave Singapore. I stayed because I had to prepare work for the first conference I ever organized. It was the annual conference of my institute and I invited Gi Yeon from Korea but also about 20 other great scholars. The outcome of the conference made me very happy and I am currently working on the book that comes with it. In the middle of September I went to Hamburg and Bochum. Again I had a weekend layover in Doha to say hello. In Hamburg I stayed with Peggy and I could also see Katharina, Matthias and Lena again. Also Peggy took good care of me and surprisingly Nadia from Singapore was in town too. The only thing that was dull was that I lost my passport on the way because I still can’t take care of my belongings. After saying sad goodbyes and being unhappy about leaving everyone behind once again, I went to Bochum. Luckily I could meet my mother there for dinner and catching up. I also managed to meet my favorite highschool friend and roommate of three years, Hedi. We even managed to have some cake with our old music teacher. The conference I attended in Bochum was interesting too. On the way back to Singapore I realized how good it is to be able to catch up with everyone, even if it is just for a short while. In October I took my temporary passport and went off to Ankara to speak at a conference and look at the city. The conference was quite good and the city was much more interesting that people told me before I left. In November TigerAir did not let me fly to Jakarta to visit my friend Kim because of my temporary passport. I understand, it looks like a toy. A week later I finally got a regular new passport which makes me happy. For the next trip I intend to duck tape my passport to my belly so I can not lose it again. Next week I am going to Sri Lanka to meet Lars for a Christmas and new year’s exploration of the country a who is also living in Singapore. We will be accompanied by Lisa who work at the neighboring university here. As you can see, I am still in an extremely privileged situation and honestly wonder until when this will continue. The situation is not only privileged because I get a temporary passport within three days and a new one within six weeks, I am able to see different parts of the world, I am eating good food, my job is mostly fulfilling and I seem to attract an incredibly loving bunch non-automated friends. And don’t forget all of the cake I ate all year! Singapore gives me the chance to meet people from all sorts of backgrounds and I keep on learning. People are still the most important aspect of my life. Still lucky to find friends that become close friends everywhere. With keeping the old friends and making new ones there is a steady increase of valuable, lovable, loving and beautiful humans (and now also some dogs) in my life. I have no idea why I am still unhappy or frustrated at times, I am annoyed with not seeing how well I am doing at all times and being ungrateful at others. I guess, I keep on working on it. Please enjoy the visual impressions of the year and the song about cherry wine – uh-hu! What I learned this year: The American concept of dating does not work for me, writing book proposals gets a lot easier with practice, a lot more food is fried in pork fat than you think, it takes a lot of hard work getting out of my own head – most of the time it doesn’t work. No one is more attached to their phones than Singaporeans. Car-washing with a DJ is a Sunday afternoon activity in Johannesburg. It is always OK to add beans and corn to your shaved ice desert. Staying with one kind of drink for the whole night does not prevent a hangover. Money can’t buy you happiness but a walk in the forest can. More sleeping does not make me less tiered. If they are your friends, it doesn’t matter where you live. You can always hang out. This summer no one yelled at me in Berlin which makes me think the indigenous are dying out. If you think last year was a crazy traveling year for me, you will be surprised about this year. I am surprised myself. The year started with a visit by Stefan and Steffie who came to Singapore and left with me to Vietnam. We spent some time in in Hanoi and had a breathtaking experience in Halong Bay. I kayaked around some of the small islands and soon our ways parted because I had to go back to my office and my friends had to continue traveling. In February my mother came for a visit to Singapore and we went to Phuket together to relax a little. In the month of March I almost felt, I am not moving at all because there was no need for me to go to the airport. But luckily, I found myself on the way to Bangkok in April to see Peggy, Oystein, and Casey and met up with Jochen, Claudia, and Felix on short notice. I made a new friend: Marie from Tokyo. On the way back, I took Peggy with me because she needs to know that I am alright on the other side of the planet. Three weeks after Peggy left, I found myself on the road again with my roommate Vindhiya and we were climbing volcanoes and temples in Java. Definitely an adventure that I will not forget. In June, I moved to a new apartment. But I also went to Belgrade for Dragana’s and Alex’ wedding and to hang out with all my Oslo friends that made their way over to Serbia. From there I took the plane to Berlin to see friends and family, celebrate my grandma’s 88th birthday and dance at an open air music festival. Because I am so hungry for life and I have problems standing still, I went on a mini-break to Taipei in July with my friend Katharina who I have met during Dragon Boat training in Singapore. We had a great view from Taipei 101 and went dancing at Luxy. In August, and September I needed to rest because, there should be a time where I am not constantly on the road. Also I needed to take a deep breath for the last trips of the year. Luckily, first Wiebke and then Anne stopped by Singapore for a quick hello. In October I flew down to Johannesburg to finally see Lilli again who I haven’t seen in a very log time. After that I had a quick mini-break in Bandung with Nabha, visting a vulcano and a sulfate lake. Just now I am in Tokyo because I went to a conference in Kyoto last week. As a very lucky girl, I was able to hang out with my new friend Marie that I met while being in Bangkok in April. And tomorrow I will see my friend Miki in Chiba who I have not seen in about a hundred years. Surpisingly, from Berlin to Johannesburg and from Singapore to Tokyo young people dress in variations of what fashionable people in Stockholm would wear. I am so grateful to be able to live this life. I know this is not how most people spend their year and most likely many people would feel this is too much. For me it is an opportunity to catch up on life again. Especially, after feeling stuck during the PhD years. I know, I know. Most of you think Supernele is just out for a good time and parties like a rock star. But I also worked during the year and managed to get two edited volumes published that you can now buy:) I had a round table discussion with the Jordanian King, I had lunch with Singapore’s former Prime Minister, and I published a research paper. For next year, I am already working on a new volume, an international conference, and of course my own book. In addition to that, I plan to take it easy, travel less, love more, give more, breathe more, and sleep more. As I am thinking about my year, I feel thankful for meeting a bunch of really wonderful friends on my way. The older I get, the more I have the feeling the world is my home and it is a pleasure living in it. An what will I do for Christmas? I will fly of to Lombok on Monday to celebrate Christmas at the beach. 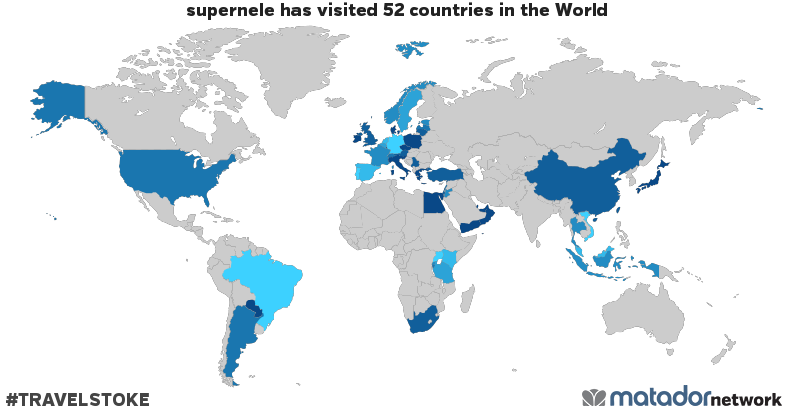 supernele has been to: Argentina, Austria, Belgium, Brazil, Burundi, China, Czech Republic, Denmark, Egypt, Estonia, France, Germany, Greece, Hong Kong, Indonesia, Ireland, Israel, Italy, Japan, Jordan, Kenya, Latvia, Lebanon, Lithuania, Luxembourg, Malaysia, Netherlands, Norway, Oman, Palestinian Territory, Paraguay, Poland, Portugal, Qatar, Rwanda, Serbia, Singapore, South Africa, Spain, Sweden, Switzerland, Taiwan, Tanzania, Thailand, Turkey, Uganda, United Arab Emirates, United Kingdom, United States, Vatican, Vietnam, Yemen. Get your own travel map from Matador Network.